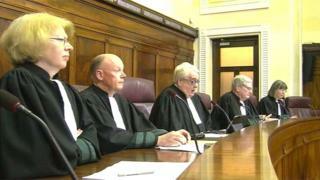 Court proceedings have been broadcast in the Republic of Ireland for the first time. Two judgments handed down by the Irish Supreme Court in Dublin were aired in a pilot project on Tuesday. National broadcaster RTÉ filmed the two judgments, which lasted about 20 minutes, using small robotic cameras inside the court room. It was screened live on RTÉ's online player and carried in later TV news bulletins. Chief Justice Frank Clarke said it would be a way of demystifying the courts process. He described it as a "baby step" which could lead to wider filming of the courts in the future. In the first case the court dismissed the challenge by an Irish man to his extradition to the US to face 51 counts of mortgage fraud. Patrick Lee from Newtown, County Kildare, had claimed that he should not be extradited because he could be prosecuted for the same offences in this country. The five judges unanimously dismissed his appeal. The second case concerned a man who suffered significant abuse after being misdiagnosed with an illness as a very young child. The abuse happened after he was sent by one institution to a nursing home to be treated. The nursing home was not covered under the Residential Institutions Redress Act. The High Court found he should be compensated for what happened in the second institution. The Appeal Court ruled he should not be. In a majority ruling of four judges to one, the Supreme Court overturned the Appeal Court decision and ordered the matter to go back to be reviewed again. It is hoped further proceedings from the Supreme Court will be broadcast over the next few months. Eventually it is hoped arguments from lawyers will be broadcast and that in the future the project may be widened out to include Appeal Court rulings.